This message is a doozie, but it strikes to the heart of a problem, i.e. political correctness . “Let me see if I’ve got this right. You want me to go into that room with all those kids, correct their disruptive behavior, observe them for signs of abuse, monitor their dress habits, censor their T-shirt messages and instill in them a love for learning. You want me to check their backpacks for weapons, wage war on drugs and sexually transmitted diseases, and raise their sense of self-esteem and personal pride. You want me to teach them patriotism and good citizenship, sportsmanship and fair play, and how to register to vote, balance a check book, and apply for a job. You want me to check their heads for lice, recognize signs of antisocial behavior, and ensure that they all pass their final exams. Well, you know what you can do with your job……..
We all should have the same rights, whatever your religion. This should be posted in every school in America and all countries. If Muslims can pray anywhere, why are Christians banned from praying in public and from erecting religious displays on their holy days? What happened to our National Day of Prayer? Muslims are allowed to block off major streets, in all American States and pray in the middle of the street! And it’s a monthly ritual! Tell me, again, whose country is this? THIS IS THE BEST LESSON ANY TEACHER CAN GIVE!!!!!!!!!!!!!!!!!!! !and it’s the truth! NOW THIS LADY IS A TEACHER!!! And so, they came and went, the first period, second period, third period. Still, no desks were in the classroom. Kids called their parents to tell them what was happening and by early afternoon television news crews had started gathering at the school to report about this crazy teacher who had taken all the desks out of her classroom. At this point, Martha Cothren went over to the door of her classroom and opened it. Twenty-seven (27) U.S. Armed Services Veterans, all in uniform, walked into that classroom, each one carrying a school desk. The Vets began placing the school desks in rows, and then they would walk over and stand alongside the wall. By the time the last soldier had set the final desk in place those kids started to understand, perhaps for the first time in their lives, just how the right to sit at those desks had been earned. Do you think this email is worth passing along so others won’t forget either, that the freedoms we have in this great country were earned by our U.S. Veterans? ………………. I did. As a child in grammar school I read a lot of books. Once I discovered the local library my world opened immensely. I lost myself in reading books about early American life, the frontier life. I especially enjoyed reading about colonial America. The Revolutionary war held my interest and I reveled at the exploits of our Patriot Citizens who formed an army to fight the mighty British. As an adult, I often bad mouth the French for their attitude toward the US, but when I read accounts about the founding of America, I realize just how critical French help was to making victory possible. This winter I have read a few books more than I have in the past, and on my last trip to the library I spotted a book that piqued my interest. The author’s name did it, Newt Gingrich. Gingrich has been somewhat controversial in recent years He served in Congress and was Speaker of the House during the Clinton Administration. He is largely responsible for Clinton’s successful second term as President. Clinton is often praised for leaving a budget surplus for the next president. The truth of the matter is that Gingrich as Speaker orchestrated legislation that Clinton very wisely signed into law. Newt Gingrich is a historian. Before entering politics he taught history. His love of history is clear in “Victory at Yorktown.” Reading this story brought back memories of my fourth grade début into the world of history. 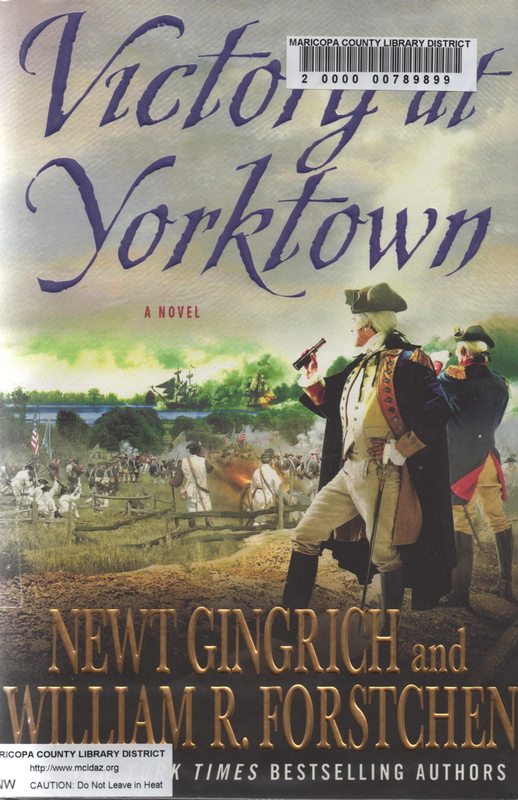 Gingrich with co-author William R. Forstchen have crafted a fictional story of George Washington’s leadership to end the war and to solidify the USA. Within the story depicting the factual accounts of Washington’s strategy and the hardship his army endured for six long years there unfolds a personal account as well. Two friends growing up side by side in the colonies find themselves working as spies. One worked for the Loyalists (England) the other for the Patriots. They share a love for a single woman who has her own allegiances. Who will she wind up with, or will she survive the rigors of war? Throughout the story of the war, the authors cleverly weave the love story into the plot just often enough to keep it a fascinating read. It infuriates me when I read news accounts about modern educators dumbing down America by rewriting history books to push their ideological spin on our kids. As a child, I developed a love for my country by learning about the hardships endured by those who fought to make it happen. It filled me with pride to know I was born into that effort. The authors of the new history books want to re-direct our children into learning to love ideologies which are contrary to those of the Founders. As parents and grandparents, we must stay ever vigilant to the material being fed to our kids at school and to take action to remove offensive material, and to banish politically motivated teachers from the system. Free education in the USA is a joke. There is nothing free about it. We pay dearly in taxes. The education opportunity given to our children is a golden gift. They waste the gift from grades 1-12 daily. Our kids just do not get it. They are too young to get it on their own. The problem is with parents who fail to take their parental responsibility seriously. My own parents did not have the same opportunity that they gave me. Their formal education was at a fourth grade level. Both Mom and Dad left their homes in a foreign country to migrate to America as teenagers. The experience of coming to a new land on your own at age sixteen is unimaginable. Yet, there were thousands of European kids coming to America for a better life. When they arrived, they did not find a friendly country. People called them greenhorns and hunkies. They stuck with others of their own nationality in order to survive. After they settled into a community, they attended school for two reasons: first to learn the language, second to become citizens. What I am getting to is that they understood the value of education, and insisted that we get a good one. My own philosophy is the same. My children’s philosophy is the same as mine. Our kids will not squander the golden gift. I made sure the kids went to good schools. We insisted they show us their assignments, and reviewed their homework. We talked to their teachers and gave them our permission to discipline our kids when they were out of line. Every teacher they had was a caring person who was serious about his work and my kids. I am satisfied that my kids took advantage of the gift. What makes me upset today, is the low graduation rate and the number of kids who get out of school, and do not know how to read. I hear politicians campaigning on the promise to spend more money on education. I see Chicago schools that are a hundred years old, and in need of serious repair. I see school busses lined up to deliver kids to school. I see kids getting free breakfast and lunch. I see teachers afraid to enter a classroom because of discipline problems. I see parents who do not give a hoot about their kid’s education. I see gangs substituting for parents and family in a kid’s life. All of the above only makes me mad as hell. What makes me furious is when I hear about teachers who are no longer interested or capable of teaching, and the administration cannot fire them because of their tenure. Between tenure and the teachers unions, I see my tax dollars flushed down the toilet. I recently learned that it costs $219,000.00 to fire a bad teacher in the Chicago system. As a result, the bad teachers remain in force. They ignore our kids, and waste our dollars. When they retire, they get great pensions. Our kids are screwed. 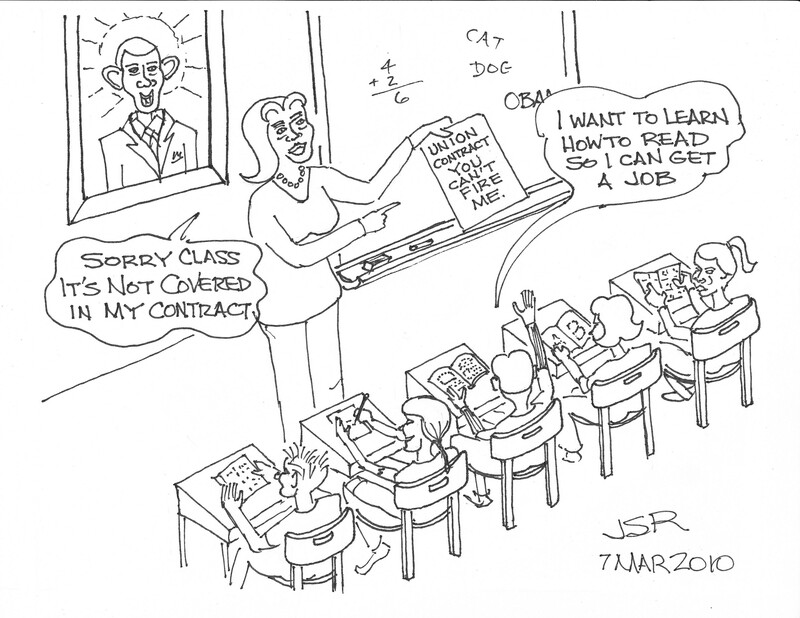 My point is that we have to make the teacher unions give a little in order to improve the school system. Certainly, more money is not the answer.